On January 29th I was driving out of my neighborhood on Bluegrass Dr. when I saw some four-nerve daisies (Tetraneuris linearifolia) flowering on a rocky embankment. They were the first flowers of this familiar species I’d seen in 2016, so I pulled over, walked back, and took a bunch of pictures by leaning against the embankment and lying on the ground to get good vantage points. Marshall Enquist gives the beginning of the bloom period for this species as March, and that’s why I was surprised to see four-nerve daisies already when we hadn’t quite left January yet. « Newer isn’t always better. Four-nerves? In a plant? Explain! Yikes! It’s nothing for a zoologist to get nervous about. You don’t even have to go out on a limb. 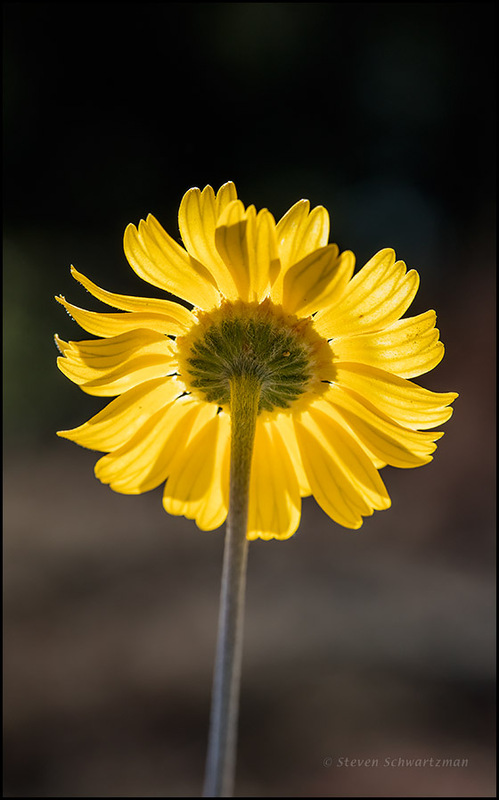 Just look half-way out on one of the flower head’s yellow rays, then do a mental cross-section: you’ll encounter the four “nerves” of the common name. In Classical Latin, the literal meanings of nervus were ‘sinew,’ ‘tendon,’ or even ‘muscle,’ and the Romans used the word figuratively for the ‘cord,’ ‘string,’ or ‘wire’ of a musical instrument like a lyre. In the Middle Ages, anatomists began using nervus with its modern meaning. Whew … and, many thanks. Greek neuron similarly meant ‘sinew.’ Apparently the ancients didn’t know about the existence of nerves. I expect people a couple of thousand years from now (and much sooner as well) will look back at us and see all the things we didn’t yet know the existence of. The early flower catches the photographer. Beautiful. Coming as early in the year as it did, it caught me up short, no question, and I was only too happy to be caught in that way. We appreciate your galvanizing comment. Thanks, Tom. Backlighting is a favorite thing of mine to look for in photographs. In this case it meant lying on the ground to get an upward angle. As for bloom periods, I saw a group of Texas dandelions (Pyrrhopappus multicaulis) growing alongside TX 146 the other day. Enquist gives the beginning of their bloom period as March, too. As many times as I’ve photographed four-nerve daisies, which are common in Austin, I was pleased to get a different view here. For the saturated yellow you can thank the backlighting, courtesy of my friend the sun. I believe the green structures beneath the flower head’s center are bracts. (When in doubt, guess bract and you have a good chance of being right.) In the Asteraceae, each such bract is called a phyllary, and the collection of all those phyllaries is known as the involucre. Your confirmation of the Texas dandelions is evidence that we’re indeed in for an early spring this year. I haven’t seen any of those here yet, but it shouldn’t be too much longer. Yellow upon yellow: how mellow. That’s how I saw it, Nora. Beautiful image and interesting science information relating to nerves. That information is as much etymological and historical as scientific: three for the price of one. The lovely warm illumination of the back-lighting (top-lighting more accurately in this instance) really makes this a beauty of an image, Steve. I think these may be the vanguard of many early firsts for you. I am expecting some here, although we did actually have a few inches of snowfall today and the temperatures will finally approach a more normal level in the mid-teens tonight. I used the term backlighting loosely, it’s true; the sun was definitely “up there.” Maybe I’ll take about translucence from now on in cases like this. Unless we get a substantial freeze here, you’re probably right about the four-nerve daisies being the vanguard of spring wildflowers. There are plenty of basal rosettes and other growing green things on the ground now. Your mid-teens there, normal for February in New England, will delay the same sorts of growing things for you. You have outdone yourself, Steve. I love the glow in this photograph! Thanks, Lynda. I was happy with the glow too, which portrayed this familiar species in a new light. Como un sol mirando al cielo. Bellísima fotografía, Steve. Y yo habiendo mirano al sol mirando al cielo. Una cadena de miras. Nice shot. I am fortunate enough to have planted Four-Nerve Daisies, Damianita, and Blackfoot Daisies in my “nuisance strip” as the HOA refers to it. Have had something in bloom throughout the fall and winter. Been a while since I lay myself down on the ground and shot up through the daisies. Might try it again – thanks for the inspiration. I’d call it an anti-nuisance strip, given the wildflowers you’ve decorated it with. It’s the HOAs that can be the nuisances. As you’ve seen here, lying on the ground offers a different perspective on many wildflowers and can lead to good pictures. Just make sure to use a mat to mitigate some of the harshness of the inhospitable (to human flesh) Texas ground. I think it’s beautiful! The flower lends itself really well for backlight. I covered a few of these of the ornamental kind, now I realize how far I am from really knowing this Asteraceae family. I think it’s the 2nd largest family after the Orchidaceae. I’ll keep my eye open for ‘Tetraneuris’. One thing is for sure, we don’t have as many as you do over there! Thanks, Maria. I’ve also read that Asteraceae is the second largest botanical family, after Orchidaceae. That may be true for the world as a whole, but in Texas the members of the sunflower family far exceed those of the orchid family. There are so many superficially similar species here that people even refer to them as DYCs, or darn yellow composites. The four-nerve daisy is one of those. If you go looking for relatives, be aware that not long ago Tetraneuris was still classified as Hymenoxys. ooooooooooo oooooooooooooooooooooooo halting to stare and to emit excited motions and sounds! Now that’s enthusiasm! Go-oh-oh-oh for it…. They’re already here in Austin, where the weather forecast for today and the next few days calls for clear skies and highs near 80°. May you bask in the reflected warmth, and may you get to experience the real thing soon.